The Inter-American Development Bank (IDB) is working with other multilateral development banks (MDBs) and international organizations (IOs) to define common mechanisms and policies to tackle the infrastructure gap in Latin America and the Caribbean (LAC) by attracting more private investment. Governments, MDBs and IOs currently agree that private investment will flourish in a more favorable environment, one in which the political, institutional and regulatory context attract private investment. An additional challenge for securing private investment in infrastructure is a general lack of well-prepared projects that are attractive to private partners. Large infrastructure projects require a great deal of planning in the pre-investment phase, including studies that address the technical, environmental, social, financial and legal challenges associated with a project. When executed properly, such studies can reveal unanticipated insights, enabling both public and private parties to mitigate and price those newly identified risks. 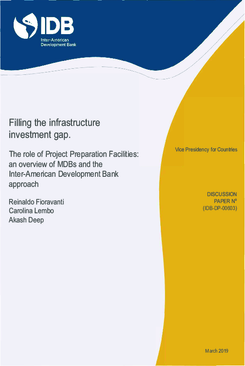 This paper provides reflections and considerations as to how MDBs including the IDB can use the Project Preparation Facilities (PPFs) to help countries fill the infrastructure gap by improving the quality of projects, reducing and mitigating risks, and leveraging private financing. Similar Studies have been conducted for PPFs in Asia , Africa and Europe. However, there is no similar assessment for LAC . This paper is the first step towards utilizing the resources offered by PPFs for infrastructure development projects in LAC, and applying these useful tools to another critical region.